GN Solids Control is a leading manufacturer on solids control and various mud treating systems. With the increasing demands of the clean water recycling, GN Solids Control provides various mud treating systems based on customers’ special demands. 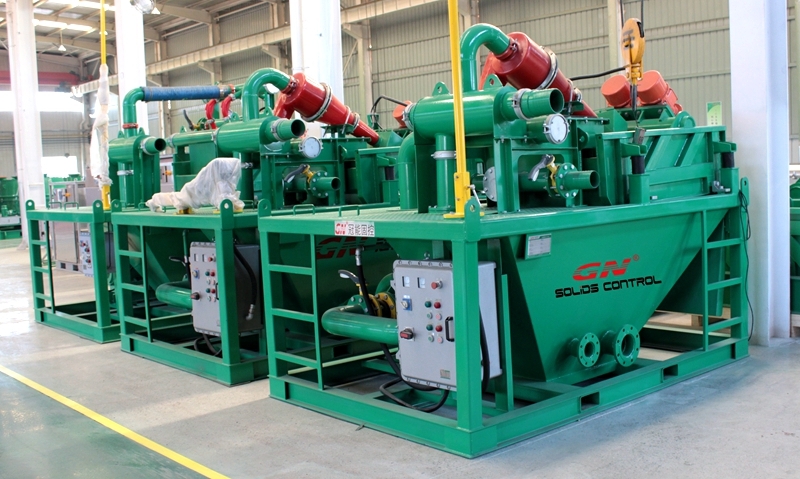 GN Solids Control manufactures the whole product lines for solids and liquid separation, equipment such as shale shaker, desander, desilter, mud cleaner, decanter centrifuge and cuttings dryer as well as some other equipment. GN Solids Control now manufactures various mud treating systems. Recently, GN Solids Control has provided some water well drilling mud systems to global customers. GN water well treating mud systems are divided into different types, include 200GPM, 350GPM, 500GPM and 1000GPM. Most of the GN Mud Treating Systems are designed and manufactured into a pretty compact structure. As the water well drilling slurry is mainly composed by water and solids, usually shakers and cyclones are used. GN Shale Shakers can separate the solids larger than 100 microns, while GN 10 inch and 4 inch cyclones can separate the solids larger than 50 microns and 25 microns. With the shaker and cyclones assembled on one mud tank, GN compact mud treating mud system easy to move among different worksites. GN Solids Control also provides trailer mounted mud treating systems and skid mounted mud treating system. Besides those water well treating mud system, GN Solids Control also provides mud treating systems that can be used in some other solids and liquid separation area, such as Trenchless Mud Treating, HDD mud treating etc. GN Solids Control also provides decanter centrifuge for the finer solids separation. Generally speaking, solids larger than 2 to 5 microns can be separated out by using decanter centrifuge. Now GN Solids America LLC has some shale shakers, mud cleaners and decanter centrifuges as well cuttings dryers stocking in Houston warehouse. Thousands of shaker screens are also largely stocked in Houston warehouse for fast delivery.